This graph, besides showing naively in a rather simplistic way the structure of the theory of differential geometry (and most of what I have implemented in the diffgeom module), brings attention to the one non-trivial part of the module on which I have spent most of my time lately. Namely, implementing covariant derivatives. All directional derivatives are defined as a limiting procedure on a transport operator. 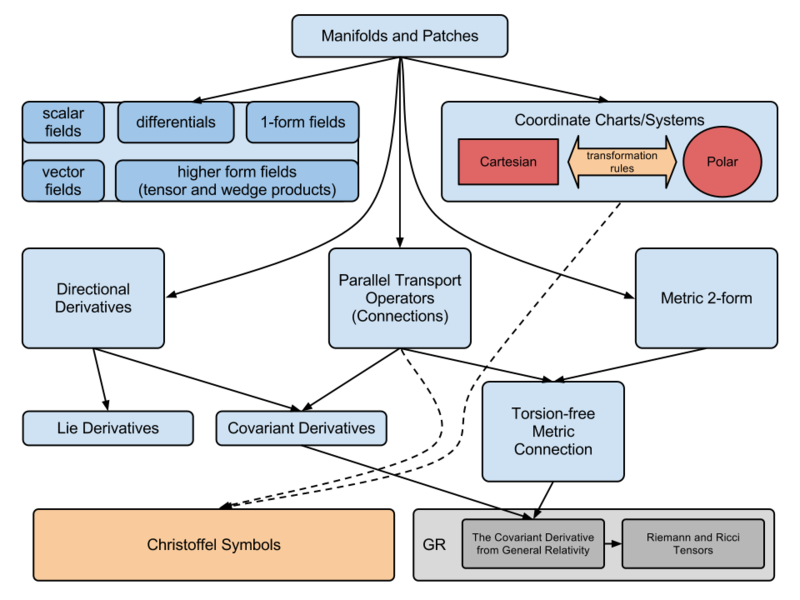 Besides the Lie derivatives which use a certain transport operator that is easy to express in a coordinate free way, all other derivatives, called covariant derivatives have to be expressed using something called Christoffel symbols. And these are the ugly coordinate-dependent sources of pain, as the module structure becomes very cumbersome when such dependence must be accounted for. Thankfully, I think I have found a nice way to implement them in a new CovariantDerivativeOperator class on its own, that will contain all the logic in the same way in which the Base*Field classes do it. This will also require rewrite of the LieDerivative into a LieDerivativeOperator class. Конкурс по Физика "Миню Балкански"